John Jefferson ( Jeff ) Davis was a two time all-state football star at Jefferson High School in 1959 - 60. He was a two time high hurdle and low hurdle state champion in track and field in 1959 and 1961. He ran anchor on the state champion 440 yard relay team in the 1959 state meet in which Jefferson won their first state track and field championship. As a 14 year-old freshman in 1958, Jeff finished 3rd in the high hurdles and 5th in the low hurdles at the state track and field championships in Macon. He finished state runner-up in the high and low hurdles in 1960 while competing with a serious thigh injury. He was state runner-up to Jefferson's Gary Duke in the long jump in 1959. He also was state runner-up in the long jump in 1960 and 1961. He was the son of Jefferson High School football and track coach John W. Davis. Coach Davis also served as Athletic Director. Jeff was a three year letterman in basketball and a four year letterman in football, baseball, golf and track. Jeff played in the Georgia High School Association all-star game after his senior year. He attended Georgia Tech on a football scholarship where he was a three year starter on defense and offense as a cornerback and running back. 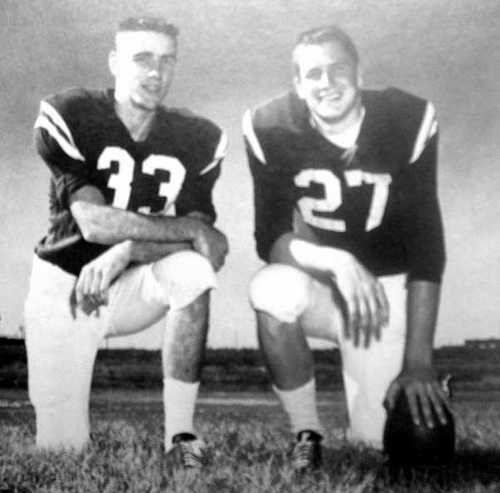 Jeff ran for 1,790 yards and scored 23 touchdowns in the 1960 football season as the Jefferson Dragons completed a 6 - 2 - 2 season. Many long-time Jefferson fans still remember his famous "firecracker run" from the Madison County game on Halloween night, October 31, in 1958. After stopping the Red Raiders on the one-foot line, sophomore quarterback Davis took the snap from under center and ran directly behind his center, straight up the middle of the field toward the Madison County goal. At about the opponent 30-yard line, someone from the Madison County sideline threw a firecracker almost directly into his path to the goal. Davis was oblivious to the prank, as he never altered his path as he finished off his still record touchdown run of 99-yards. The Dragons won the game 38 - 0. Davis starting an extrordinary 69 yard touchdown run versus Georgia Industrial on a night he scored five touchdowns for the Dragons. Davis scores on a 79 yard punt return against Washington-Wilkes in 1959 at Memorial Field. Davis was most Valuable, best back and scholar award winner in 1960. Davis scores two points for the Dragons. Jeff played short-stop for the Dragon baseball team for four years. A state winner in the hurdles and relays and an excellent long jumper for four years at JHS. Jeff was the team leader on the golf team for four years.